A grant from the Hansen Foundation funded a portion of the salaries for fifteen FHSU student internships. Business partners also contributed. 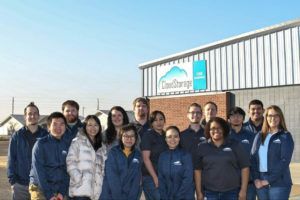 Cloud Storage Corporation sponsored a student and two internships this academic year. Their intern worked as an accounting clerk and has accepted a part-time position with the company. Cloud Storage Corporation is interested in continuing to host a Hansen Foundation intern. As a result of the positive experience with the internship, Cloud Storage Solutions has established a new scholarship with the Fort Hays State University Foundation to benefit current and future accounting students.